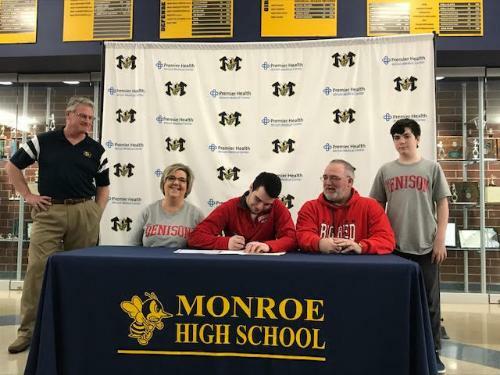 The Monroe High School Athletic Department celebrated the National College Signing Day on Wednesday, February 6 as Senior Tyler Hendricks committed to continuing his academic and football career at Denison University next fall. Tyler made his committment official in a special College Signing Ceremony on Wednesday, February 6, 2019 in front of family and friends at Monroe High School. Monroe High School Athletic Director Eric Silverman shared, "today is the culmination of many years of hard work, dedication, commitment and sacrifice and we couldn't be more excited for Tyler and his family. Tyler is a tremendous student, football player and person and Denison University is getting an outstanding young man who they will be prould to have represent the Big Red!